Leading Family Owned Italian Food Distributor Serving the Eastern United States Adds New Online and Mobile Payment Capabilities to Streamline Accounts Receivables Operations and Deliver Customers with Easy-to-Use Online Payment Options. OMAHA, Neb. 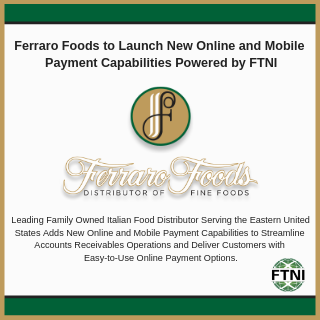 (PRWeb) April 2, 2019 – Financial Transmission Network Inc. (FTNI), a provider of industry-leading integrated receivables solutions, today announced Ferraro Foods, a family owned Italian Food distributor headquartered in Piscataway, New Jersey, has selected its Fully-hosted Online Payment Portal and Mobile App to deliver increased security, convenience and efficiencies across its Accounts Receivables (A/R) operations. FTNI and Ferraro Foods are on pace to launch these new services early in Q2 2019. Independently Held Broadline Foodservice Distributor Servicing the Northeast United States Since 1908 Delivers Its Customers with Convenient and Secure Online Payment Options. OMAHA, Neb. 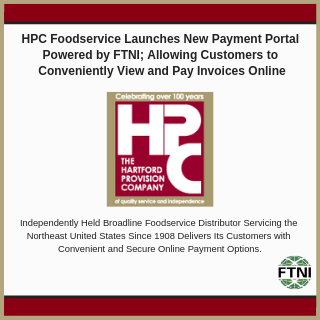 (PRWeb) January 17, 2019 – Financial Transmission Network Inc. (FTNI), a provider of industry-leading integrated receivables solutions, today announced HPC Foodservice, an independently held broadline foodservice distributor located in north central Connecticut, has launched its Fully-hosted Online Payment Portal to deliver customers with convenient and secure online payment options accessible via the HPC Foodservice website. Leading Family-owned and Operated Broadline Foodservice Distributor Serving Central, Western and Northern New York State Launches FTNI’s Truly Integrated Receivables Platform, ETran. OMAHA, Neb. 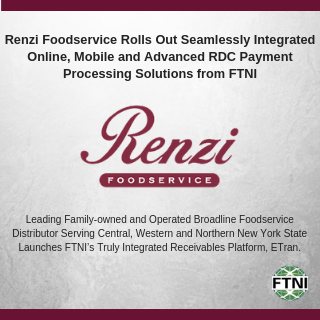 (PRWeb) December 19, 2018 – Financial Transmission Network Inc. (FTNI), a provider of industry-leading integrated receivables solutions, today announced Renzi Foodservice, one of the largest family-owned and operated broadline foodservice distributors in Northern and Central New York State, has rolled out its ETran Integrated Receivables platform to deliver the distributor with advanced Remote Deposit Capture (RDC) and Fully-Hosted Online Payment Portal solutions. Additionally, FTNI and Renzi are set to launch ETran’s mobile payment application in early Q1 2019. 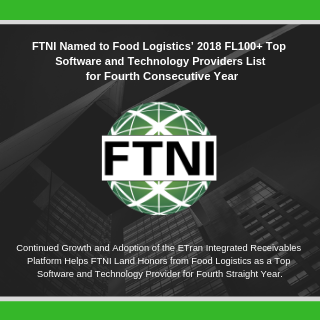 Continued Growth and Adoption of the ETran Integrated Receivables Platform Helps FTNI Land Honors from Food Logistics as a Top Software and Technology Provider for Fourth Straight Year. OMAHA, Neb. (PRWeb) December 17, 2018 – Financial Transmission Network, Inc. (FTNI), a leading provider of truly integrated receivables and straight-through processing solutions, today announced that Food Logistics, the only publication exclusively dedicated to covering the movement of product through the global food supply chain, has named FTNI to its 2018 FL100+ Top Software and Technology Providers list. This marks the fourth straight year that FTNI has been recognized in the annual FL100+ listing, making its debut in 2015. Leading Wholesale Distributor of Foodservice Disposables, Janitorial and Office Supplies, Industrial Packaging, and Clean/Natural Foods Rolls Out FTNI’s ETran Integrated Receivables Platform to Streamline Accounts Receivables Operations for Check and ACH Processing. OMAHA, Neb. (PRWeb) October 29, 2018 – Financial Transmission Network Inc. (FTNI), a provider of industry-leading integrated receivables solutions, today announced Hill & Markes, Inc., an award winning, family-owned wholesale distributor of janitorial, foodservice, industrial packaging and office supplies, has launched its advanced Remote Deposit Capture (RDC) module, and is in the process of also launching its AutoPay features. Both solutions are delivered seamlessly from FTNI’s ETran Integrated Receivables platform. Leading Broadline Distributor and Restaurant Supply Company Serving Texas and Western Louisiana Selects FTNI’s ETran Integrated Receivables Platform to Deliver New Online Payment Portal and AutoPay Solutions. OMAHA, Neb. (PRWeb) September 12, 2018 – Financial Transmission Network Inc. (FTNI), a provider of industry-leading integrated receivables solutions, today announced Jake’s Finer Foods, a premier broadline foodservice distributor serving the Texas and Louisiana foodservice and retail communities, has selected its Online Payment Portal and AutoPay solutions to drive increased efficiencies within it’s A/R operations and deliver customers with new, convenient online payment options. FTNI and Jake’s Finer Foods are on target to launch these new services early in Q4, 2018. Leading Community Bank Serving Iowa and Eastern Nebraska to Deliver Corporate Banking Customers with Advanced Remote Deposit Capture and Straight-Through Processing Solutions Powered by FTNI's ETran Integrated Receivables Platform. OMAHA, Neb. (PRWeb) August 20, 2018 – Financial Transmission Network Inc. (FTNI), a provider of industry-leading integrated receivables solutions, today announced Northwest Bank has selected its ETran Integrated Receivables platform to deliver its corporate banking customers with advanced Remote Deposit Capture (RDC) solutions designed to significantly streamline check processing and cash application procedures within their accounts receivables (AR) operations. FTNI and Northwest Bank plan to roll-out these new services in Q3 2018. Leading Route Accounting Software Provider Partners with FTNI to Deliver Its Customers with Expanded Receivables Processing Solutions and Straight-Through Processing Capabilities. OMAHA, Neb. (PRWeb) August 9, 2018 – Financial Transmission Network Inc. (FTNI), a provider of industry-leading integrated receivables solutions, today announced a new partnership with Rutherford and Associates. 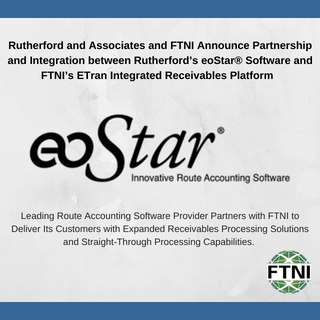 As a result of this new partnership, standard integration capabilities will be created between Rutherford’s eoStar® route accounting software, and FTNI’s ETran Integrated Receivables platform. This new integration will deliver eoStar customers with true straight-through processing functionality between ETran and eoStar. FTNI and Rutherford are on pace to complete the integration in Q3 2018. 14th Largest Distributor in the U.S. to Launch Multiple Modules Delivered from FTNI’s Truly Integrated Receivables Platform to Streamline Accounts Receivables Operations. OMAHA, Neb. 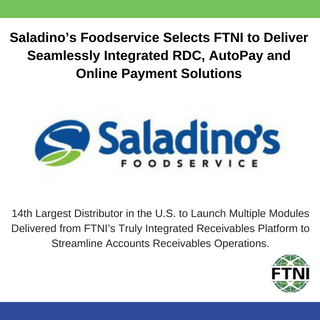 (PRWeb) July 10, 2018 – Financial Transmission Network Inc. (FTNI), a provider of industry-leading integrated receivables solutions, today announced Saladino’s Foodservice, the largest independently owned foodservice distributor in California, and the 14th largest distributor in the United States, has selected its ETran Integrated Receivables platform to deliver the distributor with advanced Remote Deposit Capture (RDC), AutoPay, and Online Payment solutions. FTNI and Saladino’s are on pace to roll-out these new services in early Q3 2018. OMAHA, Neb. 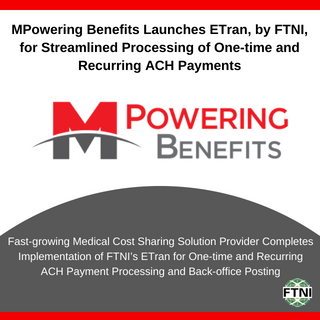 (PRWeb) June 27, 2018 – Financial Transmission Network Inc. (FTNI), a provider of industry-leading integrated receivables solutions, today announced MPowering Benefits Association has launched its ETran EPay module for accelerated initiation, processing and posting of one-time and recurring ACH payments. Copyright ©FTNI 2019. All rights reserved.